of sanitary reforms and control of disease. However, the milestone in development of vital statistics in India was to be laid by the Indian Famine Commission in 1880, which was set up following the South Indian famine (1876-78), which could have claimed up to 30 million lives! The commission suggested that the registration of births and deaths should be made legally obligatory across the country, and the regular monthly publication of the main vital statistics should be enforced. Following this a central legislation was passed in 1886 in (the then British) India. Over the years, several reviews of the Indian registration system has been undertaken and the need for a comprehensive civil registration system has been emphasised. Following a national level conference on improving vital statistics in 1961, a revised legislation on the subject was considered necessary and it resulted in the present day “Registration of Births and Deaths Act” which was passed by the Indian Parliament in 1969. This legislation provides a legal framework and guidelines for the state and the central governments to implement an effective civil registration system. This is being followed till date by all the state governments in India for collection and maintenance of vital statistics. women were dying and for what causes. We also sought disaggregated cause of death data of people below poverty line. This information is routinely collected by the civil registration authorities, so we assumed it would be easy to obtain. However, the information was denied stating that it is violation of privacy when it clearly was not so, as we had not asked for any individual information but merely data collected at the district level. 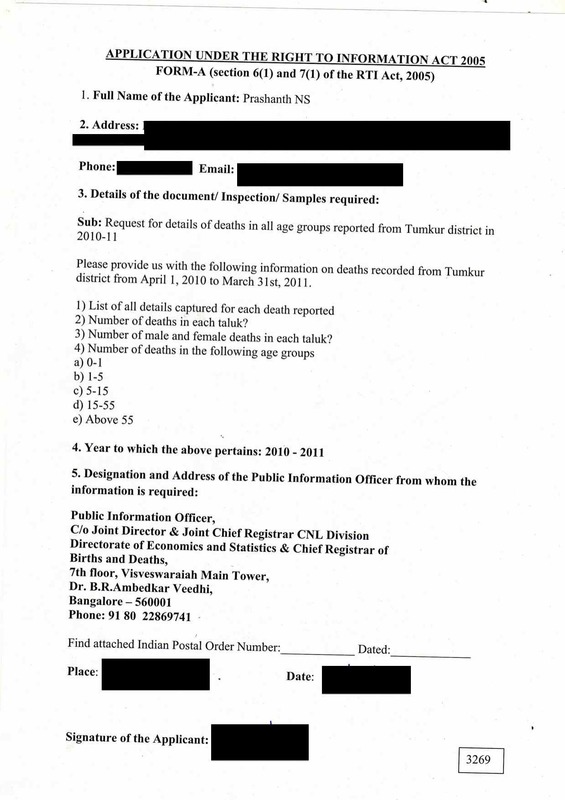 The state registrar admitted that they just publish “totals” and lose the disaggregated data. Only age-wise totals for the entire state are available! registration system. The question that we ask here is when cause of death data is not available to health policymakers, on what basis are the healthcare policies formulated or evaluated? Progress towards the Millennium Development Goals, for example rely on accurate data on causes of deaths (among other things). The past decades have witnessed a wave of health reforms in many low- and middle-income countries. However they cannot be evaluated accurately in almost every case as there is poor investment in building good systems of reporting routine data. A good example is Mexico where, we read that, there has been equal investment in health information systems as in health care reforms. This has resulted in more effective knowledge about the consequences of these reforms in this country than anywhere else in the world. The state of Karnataka records more than 90% of registrations in terms of births and deaths; it is one of the best states according to the Indian government’s recent assesment. However without relevant segregation into more specific information, this raw data is useless for health policy makers and perhaps is being collected as a bureuacratic exercise rather than enriching decision-making and policy. Accurate information on causes of death can help build effective health policy. For instance, routine data from civil registration in the United Kingdom contributed to identifying the causal association between smoking and lung cancer in the 1950s. Because of the lack of reliable vital statistics from civil registration systems, the long-term social, economic, and demographic impact of major diseases in India can only be estimated from models or resource-intensive surveys. Ranging from lack of awareness among people on one hand, to poor demand from policymakers on the other, many issues plague the Indian civil registration system. We strongly appeal for simple measures like disaggregation and public availability of such data; health care workers, policymakers, journalists and citizens should all have access to these data. 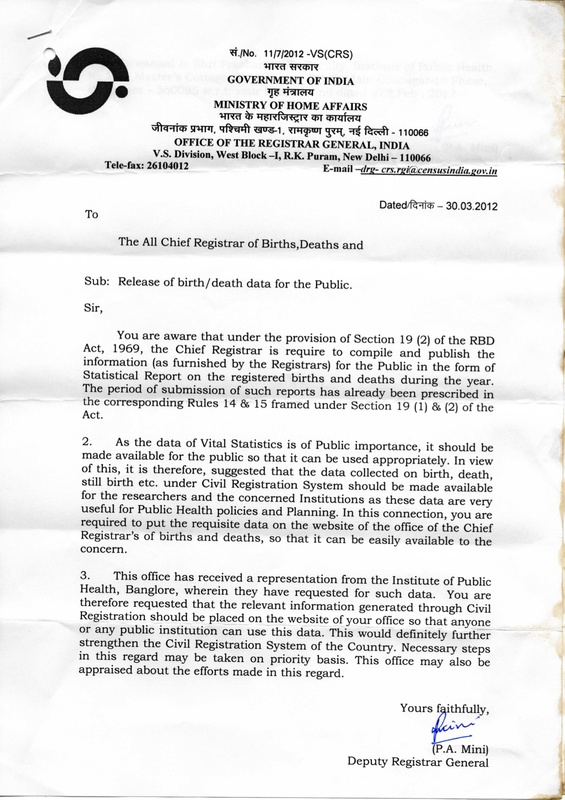 In response to a letter we wrote to the registrar general of India, there has recently been a direction to all the chief registrars of states to put in place steps to make this data easily accessible to health care workers and policy makers. Nearly a year has passed since the letter. The data continues to be collected, aggregated and the effort wasted as no disaggregated data is available to the health system or the public. Thanks to Kuruvila Daniel of IPH, Bangalore for help with the applications under the Right to Information Act. 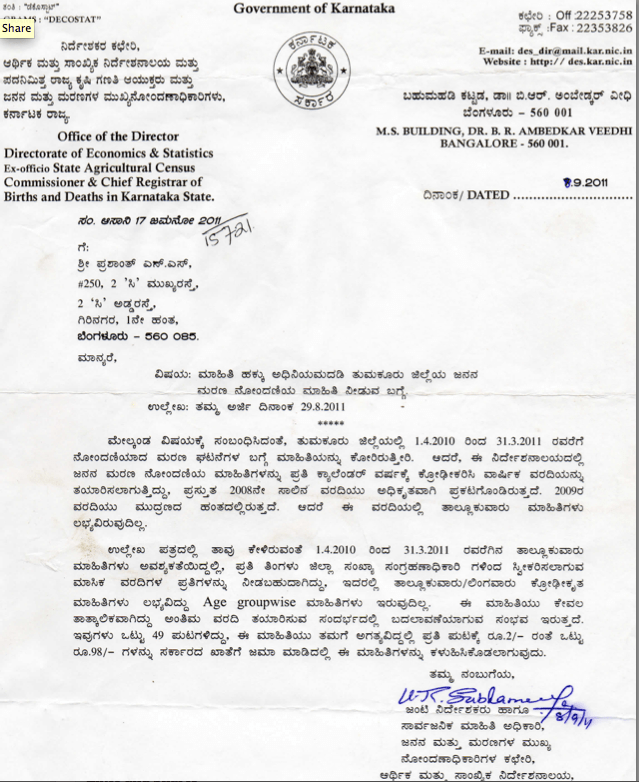 This entry was posted in Campaigns and tagged births and deaths, civil registration in india, evidence based policy, Open data, Public Health, Public policy, Right to information Act, RTI, Swasthya Karnataka, tumkur. Bookmark the permalink. Thanks for this post… I’ve often wondered about this data myself and how useful it could be for studying interactions between environmental conditions in different areas and public health for instance, which can then inform developmental plans. Its a pity that our system is still so lackadaisical in making relevant data public or in using it. Perhaps you should write about this in mainstream media / newspapers as well, if you’ve not already done so? Thanks. Yes, indeed. Right now, this is the first in an advocacy campaign to have such data in an accessible platform that enables its use. Basically, the problem seems to be merely “apathy” or rather a lack of a vision, than any other hurdle (no financial hurdles, and no bureaucratic ones either – you see above the clear letter from RGI!). We are now filing follow-up RTIs to 8 states across India to ask what action has been taken on the RGI letter after 2 years. We have also filed follow-up questions to all these states again to assess how states handle requests asking for disaggregation of data. We will be writing up the results in a newspaper editorial soon, hopefully. Can Unique ID solve everything?! But we must issue android like permissions to a central UID database. Hospitals will have read-write access to death, birth etc fields and read access to whatever is required. Let’s ask for NSA’s help in populating this database. Thanks Akshay for your very interesting response. On technological grounds, I do not see any problems with such possibilities. But, like I said, there is a lot of apathy in the system. As of now, there is an entire department dedicated to the effort of issuing birth and death certificates in Karnataka, called the Directore of Births and Deaths. They have officials and clerical staff in all taluka and district panchayat offices with an office in Bangalore as well. It is a pity, that they are not the ones thinking up the sort of systems that you and I are discussing here. But there are other issues of course on the whole UID thing including problems related to how data on people will be handled, privacy etc. But, that is altogether another debate!